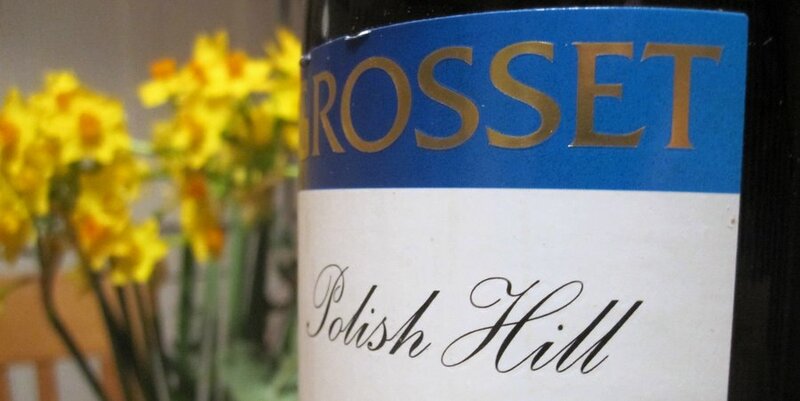 Last week I bought a couple of bottles of Grosset Polish Hill 2009 for £15.50 each. This is a wine that inspired a 20/20 score from Decanter, who called it “an all-time great”. Matthew Jukes says it should be “savoured and revered”. It is widely regarded as the greatest new world riesling, bar none. With the possible exception of similarly-priced cult-classic Lebanese brawler Chateau Musar, if it’s possible to find the most famous and admired version of a single other wine style of any standing or ageability at such low cost, I don’t know about it. The only problem is, I need to find somewhere to keep it for a decade or two. Young Clare Valley rieslings tend to be extremely dry, with wild levels of acidity. A bit like a naked sprint across a snow-covered field, they’re bracing and thrilling but not necessarily that enjoyable, really, when you think about it. They need time – quite a long time – to make good all their potential. At the A+ Australia tasting I went to a riesling masterclass with the Petaluma winemaker, Andrew Hardy, at which we tried a couple of Clare Valley wines from the fabled 2002 vintage which were only just starting to fill out, relax and discover the more generous, gentle toasty character that comes with a bit of bottle age. The only problem is, you can’t buy mature Australian riesling. The oldest vintage of Grosset riesling currently available in Britain is the 2007, of Petaluma the 2006 and of Knappstein and Plantagenet 2005, to pick four big-name producers at random. It just isn’t there. Last week I bumped into Hardy again at the Bibendum portfolio tasting and had a bit of a chat about the problem. The good news is that he has a plan, and the end is in sight, so long as you’re quite long-sighted. They would like to release mature riesling, and indeed have always held some bottles back for precisely that purpose, but are currently prevented from doing so by the high fault rate of their late-90s/early-noughties bottlings, which were still under cork. The first all-screwcap vintage was in 2003, and a batch of it will come on the market when it reaches its 10th birthday. So get a new diary and stick a flag in February 2013, because you might have some shopping to do. Their importers, Bibendum, will be the people to watch if you want to get your hands on something good (and rare) (and cheap). In the meantime, look out for Grosset’s off-dry riesling, new to the market in 2011 – soft, luscious and rich with tingly but not abrasive acidity, it appears to have just a hint of sweetness (though with almost 16 grams of residual sugar per litre it’s 39.75 times sweeter than the bone-dry Polish Hill) and already, with no decade or two of hanging about, utterly marvelous. Very interesting article and sage description of Clare Valley reislings. I find them very austere when young, but haven’t ever tried an old one, so will keep my eyes out here in Melbourne. I don’t think older vintages of Clare reisling are widely available here either. Cheers. Incidentally, I’d forgotten one Aussie riesling that does come with some bottle age – Pewsey Vale’s The Contours, from Eden Valley, whose 2004 vintage has just been released in the UK. Other or older than that and you’re struggling. Love your post. I am hanging on to 9 bottles of Grosset Polish Hill Riesling 2006.